February 27 is one date Gujarat and the rest of India would like to forget. 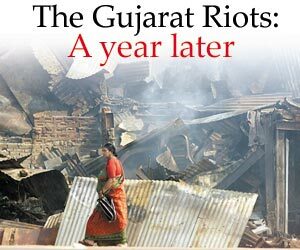 For this day last year sparked off unprecedented communal terror in Godhra and went on to envelope the rest of Gujarat. The world watched stunned as�more than 1,000 people were killed in the ensuing bloodbath. A year later, not much justice has been done. The kin of those who were slain�in the communal riots still wait for the perpetrators to be brought to justice. Most of the 5,067 rioters who were arrested, causing the Sabarmati Central Jail authorities to look for additional space to accommodate them, have now been released on bail. A total of 691 cases were filed, of which 414 have now been deemed 'without merit.' A senior police officer admitted, "We were unable to gather evidence against the accused." Two hundred and eighty accused are still at large. In 39 cases, investigations are yet to be completed. As a result, there are more cases are 'on hold' or 'pending investigation' than the 508 cases that await trial. For instance, at Vejalpur police station -- which houses Juhapura, one of the most communally-sensitive areas in the city�-- 22 of the 55 cases filed have been 'rejected' due to lack of evidence. In Meghani Nagar, where the ill-fated Gulbarg Society is located (39 of its residents were burnt alive), only one of 11 cases filed was found fit for investigation and trial. Legal experts say these cases are far from reaching a logical conclusion. Trials are yet to begin, since not one of the 961 registered riot cases have complete evidence or case-related documents. According to sources in the city's prosecution department, not even three per cent of the cases have been taken up for trial. Most of the cases still have lacunae in them, due to which they have not been able to pass even the preliminary scrutiny of the metropolitan courts. They pointed out that these courts always analyse the chargesheets and the case-related documents before they commit the cases for trial. Till date, the metropolitan courts have found only about 25 cases fit for trial. Of these,�hearing began in only�one case before the principal judge of the Ahmedabad sessions court. But even this hearing stopped after a while. The case in question pertains to the February 28, 2002, massacre that resulted in the deaths of 39 people, including former member of parliament Ehsan Jaffri, at the ill-fated Gulbarg Society. According to a senior public prosecutor, "The hearing on this case had to be postponed because the crime branch filed a supplementary chargesheet during the trial. The court suggested the case would continue once the supplementary chargesheet, which named more accused, was also committed for trial." Meanwhile, State Law Minister Ashok Bhatt has ruled out the possibility of setting up special courts to try the riot-related cases. "We will be setting up fast-track courts, but the riot cases cannot be tried in them." He said these cases wold continue to be tried in the regular criminal courts along with the other cases. The other glaring discrepancy is the number of absconders; 180 of the accused in the riot cases have disappeared. The list of absconders include eight accused in the Naroda-Patia case, 11 in the Gulbarg Society case, four for rioting at Rakhial and two for the murder of a government employee, Devanand Solanki, at Gomtipur. The police, meanwhile, continue to publish advertisements threatening absconders with strict action like attachment of immovable and movable property.�Defence lawyers believe they may finally be declared proclaimed offenders. A lawyer, on condition of anonymity, explained, "Once this happens, the cases will be on weaker ground. The chances of conviction would become slim." * Sector I, which includes Vejalpur has 15 police stations, including the hypersensitive areas like Juhapura, Sherkotda, Khadia and Gaekwad Haveli. ** Sector II has 15 police stations, including hypersensitive zones like Naroda, Meghaninagar (where Gulbarg Society is located), Dariapur, Gomtipur, Bapunagar, Rakhial, Maninagar and Danilimda. Sub: Yes, it was different!